Growing new trees from peach seed planting is difficult. but not impossible. They may be grown indoors or outdoors and make a fun project for the adventurous gardener. Cultivated since at least 2,000 B.C. by the Chinese, peaches are beloved worldwide for their sweet, delicious fruit. 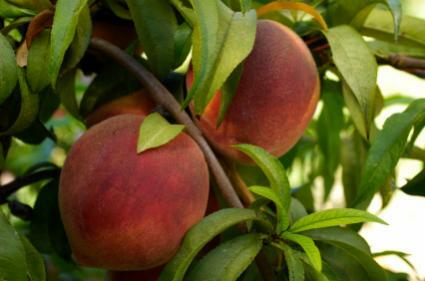 Spanish colonists brought peaches to the Americas and the early Virginia settlers found them growing wild, probably as a result of early Spanish visitors. While there are varieties of peach trees that may be grown in cooler climates, peach trees grow best in temperature to warm garden zones. There's a reason Georgia is called the peach tree state - its zone 7b climate provides the perfect growing conditions for peaches. Peaches are considered stone fruits. The stone is the hard pit in the center of the fruit. They're categorized as cling or freestone fruits. Most peaches purchased at the supermarket or roadside stands are freestone peaches. The pit easily detaches from the fruit. Clingstone fruits are named because the pit clings to the fruit, making it difficult to remove. Clingstone peaches are grown for the canning industry and are preserved and sold as cling peaches in heavy (or light) syrup. Peach seed planting is challenging. Gardeners considering a home orchard will be more successful by purchasing known varieties as mature trees from a reputable nursery. These trees have well-developed root systems and are usually varieties grafted onto sturdy rootstock. They will reward the home orchardist with fruit in the second year of growth, if not the first. Trees grown from peach seeds or stones take several years to develop into mature trees that will bear fruit. It takes time and patience to nurture such trees to maturity. Before getting started with peach seed planting, gardeners need to know the following facts. Most peaches available at the supermarket, grocery store or other food store are one of several varieties of freestone peaches grown for their early ripening and sturdiness during transportation. Some varieties will not germinate from the seed or pit. Peaches grown from seeds may not be as tasty as the fruit from which they originated. Depending on the parent trees that pollinated the fruit seed, the peach may be a cross from less tasty varieties. Expect a lot of variation once the peaches grown from seeds develop fruit. It takes several years for a peach tree to mature from seed to a fully bearing fruit tree. Peach trees, like other fruit trees, come in dwarf, semi-dwarf and standard varieties. The seeds obtained from supermarket peaches are likely standard trees. These can grow ten, twenty or more feet in height. Make sure you have room for such a tree. If garden space is limited, select trees from the garden center marked dwarf. These provide delicious fruit, but stay under ten feet or so- a very manageable height for most home orchardists. To begin your peach seed planting project, obtain peach seeds. You can collect these from fruits. Wash the seeds thoroughly and allow them to air dry.Peach seeds need several weeks of cold temperatures to germinate. Depending on the time of year you want to plant peach seeds, you can give them the right temperatures by planting them outside or keeping them in a bag in the refrigerator for a few weeks. If chilling them in the refrigerator, be sure to store them in a dry, cool place. Do not store them near apples or bananas as these fruits release a gas called ethylene that may spoil the peach pits. You can also place the peach pits in a bag at room temperature, as long as the room is cool. Basements or garages work well for this. To sprout peach seeds indoors, you will need an area with bright light or indoor grow lights. Take a clean pot and fill it with the best soil mixture you can find. The soil should be light and full of organic matter. A mixture such as Pro Mix or another bagged, sterilized soil is ideal. Make sure the soil is moist, but not soaking wet. Plant the peach seed in the middle of the pot, and press the soil very firmly around the peach seed. Keep soil most. Be sure it does not dry out. Keep the pot in a cool, bright area until it sprouts. The best way to ensure successful peach seed planting is to start the seeds outdoors. You will need to plant them at certain times of the year to take advantage of the cooler temperatures that enhance germination. After collecting, washing and drying peach seeds, store them in the refrigerator until you're ready to plant them. When you're ready, find a space in the garden with good soil or enhance the soil with compost. Plant the peach pits about three inches below the soil. You may need to spray them with Ropel or another product to deter squirrels. Squirrels love to dig up peach pits and will go to great lengths to obtain them. Mark the spot with a plant marker and be sure to keep the area moist if there's no rain or snowfall. Plant the seeds only in late fall to allow the cold temperatures to chill the peach seeds for the right amount of time. Michigan Peach Growers provides extensive techniques and tips for growing peaches from seeds. Plant Answers shares the history of the peach and information on growing peaches from seeds. Colorado State University lists tips on growing peaches from pits.